Quick Takes - Quick Takes from Voice for Liberty: Individual liberty, limited government, economic freedom, and free markets in Wichita and Kansas. The claim of 26,000 workers in downtown Wichita is based on misuse of data so blatant it can be described only as malpractice. From April 2017. Have you heard that 26,000 people work in downtown Wichita, defined as zip code 67202? It’s likely you have, as this number appears in many places. State of Downtown Report, 2016. Click for larger. It’s advertised on a vacant downtown building, the former Henry’s store at Broadway and William. The Wichita Downtown Development Corporation states the data for workers in downtown Wichita, which is defined for these purposes as zip code 67202, comes from the United States Census Bureau, specifically an application called “OnTheMap Application and LEHD Origin-Destination Employment Statistics.”8 The data is commonly known as LODES. Using this application and focusing analysis on zip code 67202 produces the figure 25,850 primary jobs. Round that to 26,000, and that’s the source of the job claims for downtown Wichita. Census block 201730043001036, satellite view. This is highly relevant and important in the case of downtown Wichita. When using the OnTheMap application for zip code 67202, there are two large bright blue dots that stand out from all others. These represent the two highest concentrations of workers in downtown Wichita. One is Census block 201730043001036, which has 7,740 employees. This is a one square block area from First to Second Streets, and Wichita to Water Streets. The block consists mostly of surface parking lots, although there are three buildings. One building is the Wichita school district administration building, and there’s the problem with the way the city uses this data. The school district has thousands of employees. Only a small fraction, however, work in the downtown administrative building at First and Water Streets. The rest are dispersed throughout the city in school buildings and other sites such as the large facility at 37th Street North and Hydraulic. But this Census data counts all these employees in one census block. This is an example of the warning the Census Bureau supplies with the data: Nonreporting of multiple worksites is especially common with state and local governments and school districts. There’s another example. The second largest concentration of workers in downtown Wichita appears in Census block 201730043001023, which has 3,437 employees. This is the block that holds Wichita city hall. In 2014 the city had 3,270 employees. But they don’t all work at Main and Central. They’re dispersed throughout the city in police stations, fire stations, and other sites. Here’s something to consider: The Wichita school district is moving its administrative offices to the former Southeast High School building at Lincoln and Edgemoor. That’s in zip code 67218. What will happen to the reporting of jobs in downtown Wichita when some seven thousand workers start receiving their paychecks from an office in that zip code, and the Census Bureau adjusts it data accordingly? So how many people do actually work in downtown Wichita, zip code 67202? A different set of Census data gives the number 13,593 for 2014.10 This data is much more representative of the number of people actually working in a location, although it includes private-sector workers only. So we might add a few to that number. But it’s clear that the claim of 26,000 workers is far from true. The use of data for decision making is especially important for downtown planning, we’ve been told. In selling the plan for downtown Wichita in 2010, the city’s consultants told us that the plan is “grounded in data and hard analysis.”11 But I showed that data the consultants relied on — a “walk score” — was based on nonsensical data. The claim of 26,000 workers in downtown Wichita is true. But as we’ve seen, it is not true in the way it is used, which is as an indication of the number of human beings actually working in downtown. Did the person who gathered this data about downtown workers know what it means? If not, why not? Did the person who decided to use this data in marketing downtown Wichita know what it means? If not, why not? If someone knew the meaning of this data and decided to use it anyway: What does that tell us? Did no one at Wichita city hall look at this data? As I’ve shown, it’s easy to see that the mapping application says 3,437 people work in the block holding city hall. Did no one look at the big blue dot and that number and realize that it is not real? What if you opened a lunch counter in downtown Wichita based on the claim of 26,000 daytime workers, and then you learn there are really only half that many, with some of those working at night? We want to trust our city leaders. We want downtown Wichita and the entire metropolitan area to succeed so that people may prosper and be happy. But episodes like this destroy trust and breed well-deserved cynicism. We can — we must — do better than this. In this episode of WichitaLiberty.TV: A look at Wichita community outreach and communications, rewriting city council history, and entrepreneurship. View below, or click here to view at YouTube. Episode 102, broadcast December 6, 2015. In Wichita and Sedgwick County, can we run government like a business? Should we even try? Do our leaders think there is a difference? From December 2014. Historic preservation tax credits, or developer welfare? A Wichita developer seeks to have taxpayers fund a large portion of his development costs, using a wasteful government program of dubious value. From December 2015. When you hear of a program titled “historic preservation tax credits” you might find yourself in agreement. Preserving history: Who can be against that? And tax credits: Aren’t those just technical adjustments on someone’s tax form? The Colorado-Derby Building, now renamed and used by the Wichita public school district. If you look closely, however, you’ll find that the historic preservation tax credits program can include buildings with only the slightest historic significance, and has great cost to taxpayers. The Colorado-Derby Building at 201 N Water Street in Wichita has been nominated for placement on the Register of Historic Kansas Places. 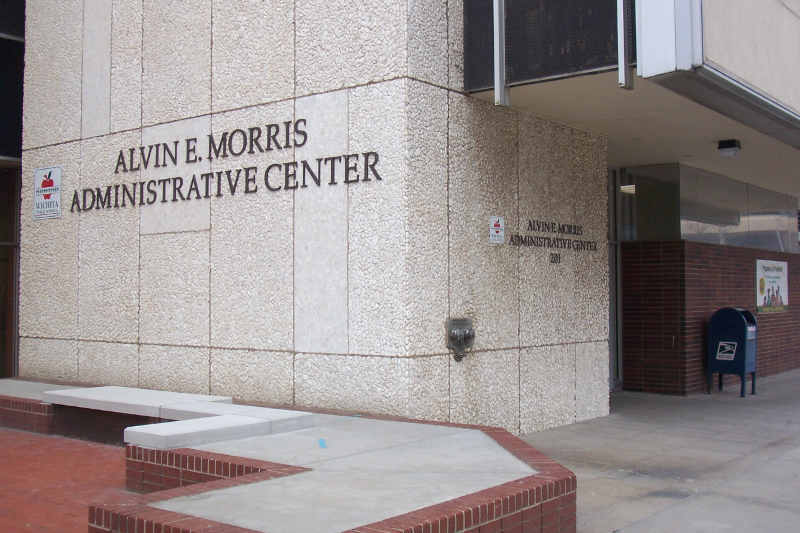 It’s a nondescript building which currently houses administrative offices for the Wichita public school district and is known by a different name. Still, it is eligible for placement on the register for being an “example of this private investment trend,” that being the building of office buildings midcentury. A laudable accomplishment, but hardly notable. The real reason for seeking placement on the register of historic places is money. By using historic preservation tax credits the developer of this building can get taxpayers to pay for much of the costs of rehabilitation. Almost half, which will be millions in this case. Under the program this building is entering, its owners will receive 25 percent of rehabilitation expenses. The federal government provides tax credits of 20 percent. It’s likely that the owners of this building will also seek these credits. So with both tax credit programs, 45 percent of the cost of rehabilitating this building could be paid for by taxpayers. And, given the history of the developer, it’s likely he will find other ways to get taxpayers to pay for even more. Tax credits may be a mystery to many, but there is no doubt as to their harmful effect on state and federal budgets. When using tax credits, the government, conceptually, issues a slip of paper that says something like “The holder of this document may submit it instead of $500,000 when making a tax payment.” So instead of paying taxes with actual money, the holder of the credit pays with, well, a slip of paper worth nothing to the government treasury. The use of tax credits to pay for economic development incentives leads many to believe that what government is doing is not a direct subsidy or payment. In order to clear things up, perhaps we should require that government write checks instead of issuing credits. Back to Kansas: The audit of the historic preservation tax credits program found that in 2001, when the program was started, the anticipated cost to the state was about $1 million per year. By 2007, the actual cost to the state was reported at almost $8.5 million. It would be more efficient for everyone if the state would simply write checks to the developers instead of issuing tax credits. But then the actual economic meaning of the transaction would be laid bare for all to see. Then, what qualifies as historic can change as political conditions require. Earlier this year the Wichita city council reversed a decision by the Historic Preservation Board and allowed a property owner to proceed with the demolition of three formerly historic buildings in southern downtown Wichita. The historic preservation tax credit program is a government handout mechanism we no longer need. Today, most of the money goes to wealthy developers or corporations that can afford to redevelop downtown hotels and lofts with their own money — instead of asking low-income families to pay sales tax on their groceries to fund their tax credits. Constructed in 1959-1960, the nine-story Colorado-Derby Building is an early example of a Modern Movement speculative office tower erected within a pattern of development that shaped Wichita’s downtown at midcentury. New buildings erected as icons on the skyline were intended to refresh, modernize, and revitalize the downtown core through public and private investment in civic and commercial improvements. Frank and Harvey Ablah recognized the onset of this trend and constructed the Colorado-Derby Building to provide speculative office space, redeveloping the site of the Ablah Hotel Supply Company. Named for its largest and most prominent tenant, the Colorado-Derby Building was fully occupied when it opened in 1960 and maintained high occupancy rates over the following decade. The construction and subsequent occupancy of this building illustrates the continuing importance of manufacturing industries to the economy of Wichita at midcentury and the ability of these industries to contribute to the economic and physical revitalization of downtown. The blocks immediately surrounding the building continued to develop in a similar fashion over the following decade with large-scale modern buildings and parking lots replacing smaller commercial and industrial buildings built a half-century earlier. All of this development activity culminated in a formal Urban Renewal project utilizing federal funds in the late 1960s. In Wichita, private investment focused on providing office space for industrial companies, rather than public funding initiated the revitalization that transformed downtown. The Colorado-Derby Building is nominated under Criterion A an important early example of this private investment trend. Despite claims to the contrary, the attitude of the City of Wichita towards citizens’ right to know is poor, and its attitude will likely be reaffirmed this week. From December 2016. Drivers on East Twenty-First Street in Wichita are happy that the work on a small bridge is complete, but may not be pleased with one aspect of the project. From December 2016. The memorial plaque celebrating the accomplishment on East Twenty-First Street in Wichita. The flare from the sun is a defect of this photograph, not the marker. Click for larger. It’s a small bridge, on East Twenty-First Street between Mosely and New York Streets. At 49 feet long it is designated a bridge by the Federal Highway Administration. And we’re glad it’s there. The bridge on East Twenty-First Street. Click for larger. Does it warrant the full commemorative treatment of a bronze plaque memorializing the elected officials and bureaucrats who happened to be in office at the time taxpayers paid for this bridge? Why does the city spend so much on plaques for bridges that, in some cases, may not be much longer than wide? It’s a small matter, but these issues are symbolic of government’s attitude towards costs, and of some officials’ view of their own self-importance. It’s presumptuous, that such a mundane accomplishment would be decorated so at the expense of taxpayers. More than this, it’s preposterous. West Twenty-Ninth Street in Sedgwick County. Click for larger. The City of Wichita is not alone. As I reported in The bridges of Sedgwick County are well marked, Sedgwick County does this, too. And doubly so. The bridge in Twenty-First Street in Wichita has one plaque, but even small bridges in Sedgwick County have two, one on each side. In Wichita, it turns out we have to sell a hotel in order to fix our streets. From December 2016. Update: The Council approved these projects. In September the Wichita City Council decided to sell the Hyatt Regency hotel in downtown Wichita for $20 million. Now the council will consider two proposals for spending this money. Whatever the merits of these spending programs, Wichita is taking a capital asset and using it to fund current spending. In particular, street maintenance needs to be performed continuously. Here, the city has not been taking care of streets that taxpayers paid for and entrusted to the city for care. It turns out we have to sell a hotel in order to fix our streets. But street maintenance is something that needs to be performed — and paid for — every year. We shouldn’t have to rely on a sale of a capital asset to fund daily needs. Following, from October, what the city should do with the Hyatt proceeds. Instead of spending the proceeds of the Hyatt hotel sale, the city should honor those who paid for the hotel — the city’s taxpayers. The City of Wichita has sold the Hyatt Regency Hotel for $20 million. Now, what should the city do with these funds? In a workshop this week, the city manager and council recognized that these funds should not be used for operating purposes. This is important. The Hyatt Hotel was paid for with long-term debt, which the city says has been retired. The proceeds from this sale should be used in a similar way: For long-term capital investment, not day-to-day operating expenses. But the council heard two proposals that are decidedly more like operating expenses rather than capital investment. One proposal, presented by Public Works Director Alan King, is to spend $10 million on street repair over two years. Part of that expense is to purchase a new truck, which is a capital, not operating, expense. But King later revealed that the truck could be purchased out of the existing capital budget. Street maintenance, however, is an operating expense. This, too, is an operating expense. As these proposals were presented in a workshop, no decision was made. These two proposed uses of the $20 million Hyatt sales proceeds are contrary to the goal of not using the funds for operating purposes. If the city decides to use the sales proceeds in this way, a capital investment will have been sold in order to pay for day-to-day expenses. Instead of spending on these two projects, the city should simply return the money to those who paid for the Hyatt in the first place. Those people are, of course, the taxpayers of Wichita. It would be difficult to give back the funds to individual taxpayers in proportion to the amount they supplied. So what the city should do is retire $20 million of the city’s long-term debt. If not that, then the city should use the Hyatt proceeds to pay for another long-lived asset, perhaps the new downtown library. Either of these alternatives respects the principles of sound financial practice, and also respects the taxpayers. “None of the Above” voting lets voters cast a meaningful vote, and that can start changing things. As a voter, would you like to express your displeasure with the choices on your ballot? Are you tired of voting for the lesser of two evils? Would you like to have a reason to go to the polls even though it seems the contests are already settled? Politicians don’t like “None of the Above.” Appearing on WichitaLiberty.TV recently, John Fund told of how a politician worried that he might lose to an empty chair, meaning that “None of the Above” received more votes. Fund retorted that would be true only if the chair was better. What would we do if “None of the Above” won the election, having received more votes than any other candidate? Would the second-place candidate be declared the winner and take office? This is the case in Nevada. In this case, the “None of the Above” vote’s role is advisory, indicating widespread dissatisfaction with the candidates. But that’s a powerful message. Other people regularly vote. Perhaps a person votes because they really like one or more candidates. These people are able to make satisfying votes. Or if they really dislike a candidate, they can cast a satisfying vote against that person. But: What if the other candidate (or candidates) are no better, or have other problems? Must a person vote for the “lesser of two evils” in order to make a statement? What statement is that? In election results, a vote for candidate A from someone who really likes him is indistinguishable from a vote for candidate A solely because the other candidates are worse. Our government’s legitimacy is based on the consent of the governed. But our elections are structured so that the only way to withhold consent is not to vote. Low turnout may signal our disinterest or disapproval, but one of the unqualified candidates will still become president. We need a way to withhold consent through voting. That means we need None of the Above (NOTA) to be on the ballot. A vote of protest is important. Often I’ve refrained from voting for any listed candidates because I felt none were worthy to hold office. Sometimes I’ve felt that there should not be an office (Insurance Commissioner comes to mind), so I did not cast a vote for that office. It’s my own little way of protesting. In election lingo this is called an “undervote.” It has little meaning, because people undervote for many reasons. But voting for “None of the Above” gives voters a meaningful choice in instances like this. Voting for the lesser of two evils is a choice we often face as voters. In the recent Wichita school board election, there was one contest between a thoroughly despicable incumbent and a challenger whose ideology is distinctly Marxist. Who to vote for in this instance? “None of the Above” would be a satisfying — and correct — choice. Voting for “None of the Above” sends a message that neither candidate is acceptable. Voters who really need a “None of the Above” choice are those in Alabama. Do you want to send a liberal Democrat to the United States Senate? If your answer is no, then your only choice — if you want to vote — is to vote for a candidate facing credible charges of child molestation. That’s a choice we shouldn’t have to make. “None of the Above” voting lets voters cast a meaningful vote that says “I do not consent to these choices,” and that can start changing things.